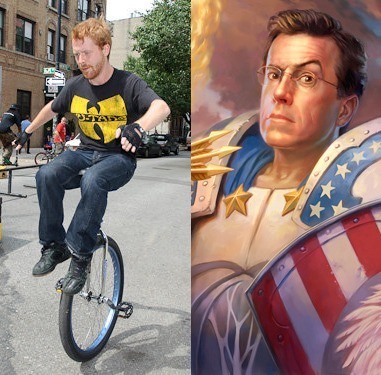 -A 180-pound unicyclist moving at 10 miles per hour can cause more damage than a linebacker in the NFL. -Unicycles are capable of creating a “domino effect” of pedestrians, leading to mass casualties. -These one-wheeled death traps ARE coming to run over your babies. -The law is powerless to stop them. Below, you can watch the segment. Because of graphic unicycle-on-pedestrian violence, viewer discretion is advised. I’m picturing the last scene of the closing credits of “Welcome Back Kotter”. He rode his in the street.